Rudy Giuliani has called for a criminal investigation into Robert Mueller for deliberately destroying FBI evidence that would expose the Russia probe as a complete hoax. In an interview with Hill.TV this week, Giuliani accused the Special Counsel’s office of destroying evidence by allowing text messages from disgraced FBI official Peter Strzok and his lover, Lisa Page, to be erased in the Russia probe. 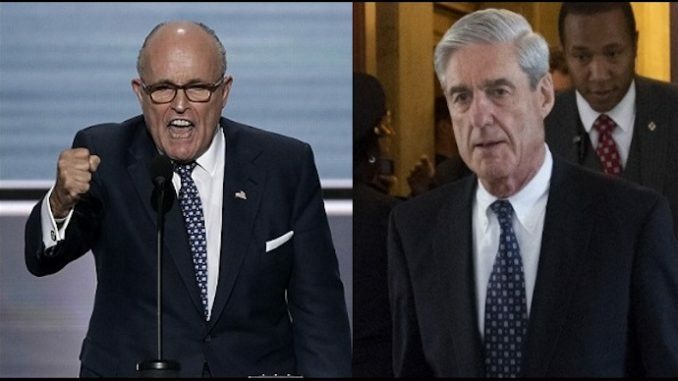 Thehill.com reports: “Mueller should be investigated for destruction of evidence for allowing those text messages from Strzok to be erased, messages that would show the state of mind and tactics of his lead anti-Trump FBI agent at the start of his probe,” Giuliani said.